Donuts. We all love them. Let's be honest and say that we've all eaten a whole dozen when no one was looking... just me? Okay. There are so many great varieties-- cake donuts, classic glazed, chocolate filled, sprinkle donuts... and then there's the French Cruller. 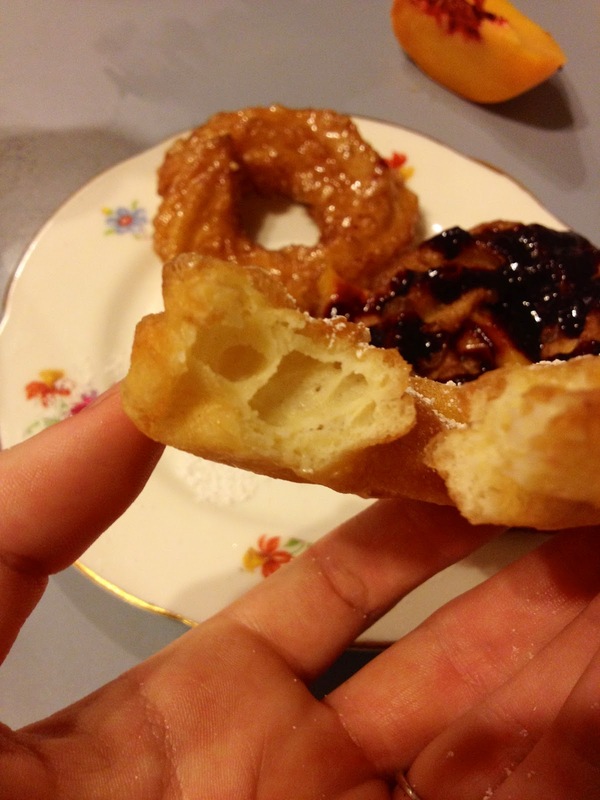 French Crullers are so soft and light, almost crepe-like inside, while still maintaining a crispy delicious outside. They can be served with any variety of glaze, sauce, and they can even be cut open and sandwiched with fresh fruit inside. I chose to do all of the above tonight. The best part? They were so simple! It's essentially just a fried Pate a Choux, and you know how friendly I am with Pate a Choux lately! 1. Using heavy bottom pan, bring water, butter, sugar, and salt to a rapid boil over medium-high heat, stirring with a wooden spoon. 2. 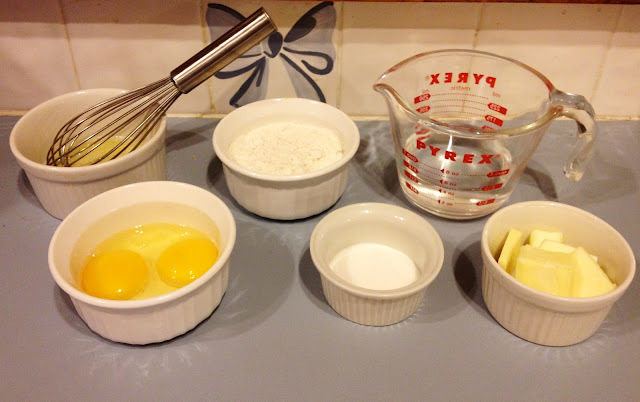 Add flour, all at once, to the mixture. Stir rapidly to get flour clumps out. When a film begins to coat the bottom of the pan, turn heat off. 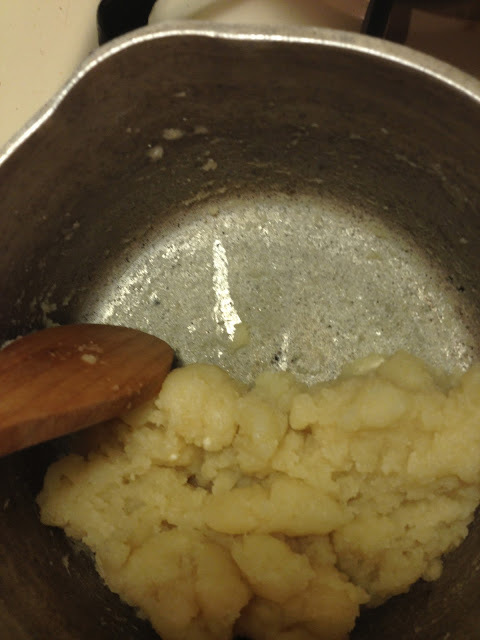 You can see if a film is developing by scraping the bottom of the pan with the wooden spoon. 3. Stir for a minute or two to cool it down. 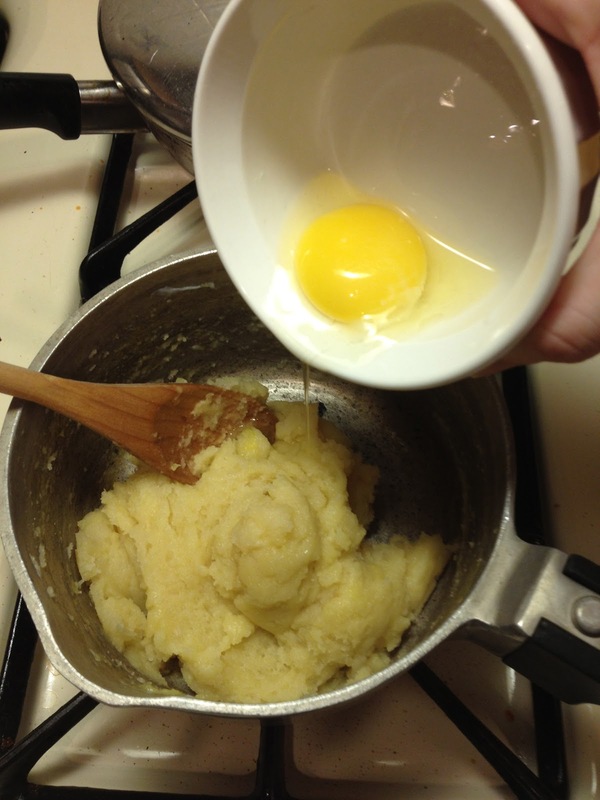 Add the whole eggs, one at a time, incorporating thoroughly in between eggs. Add the egg whites and make sure everything is fully incorporated. 4. Turn the oil on to heat up. 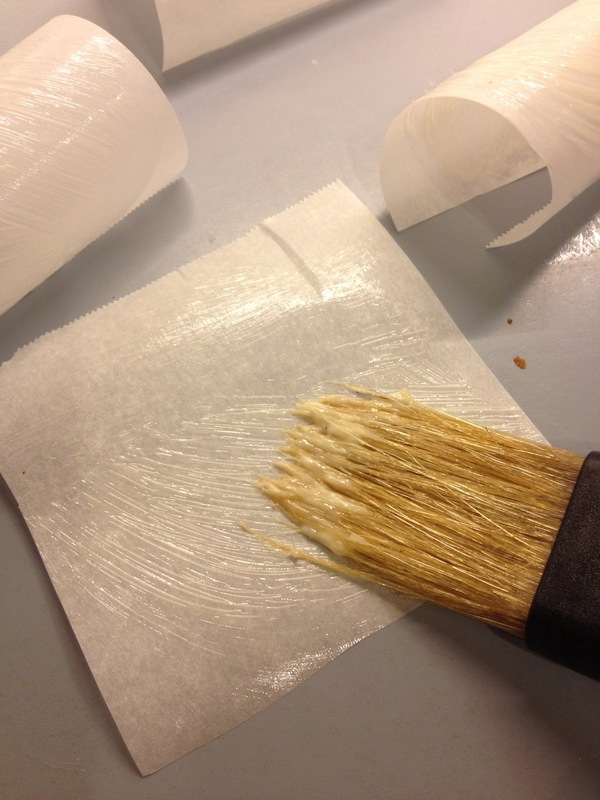 Put the dough into a gallon ziplock fastened with a 1/2 inch star tip. 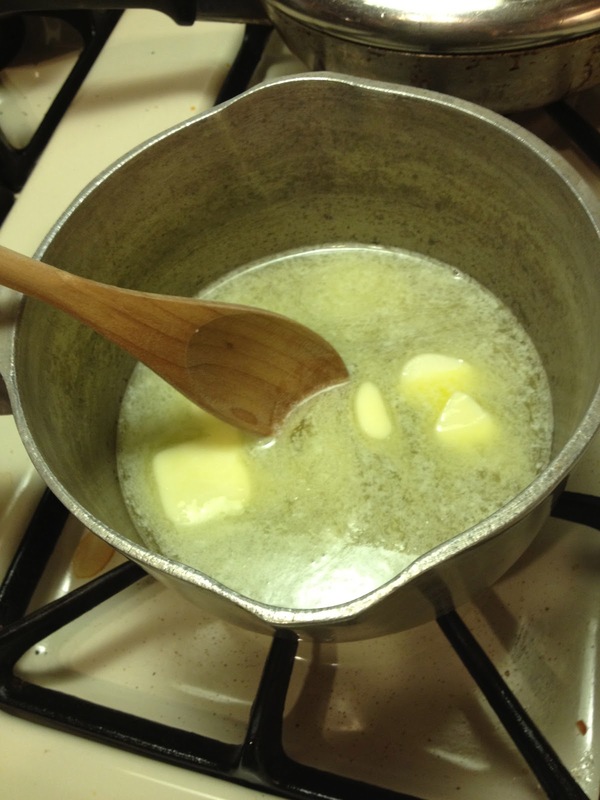 Cut 3"x3" parchment squares and butter each thoroughly. 5. Pipe 2"-3" circles, making sure to barely overlap. If you overlap too much, they will be lopsided. 6. 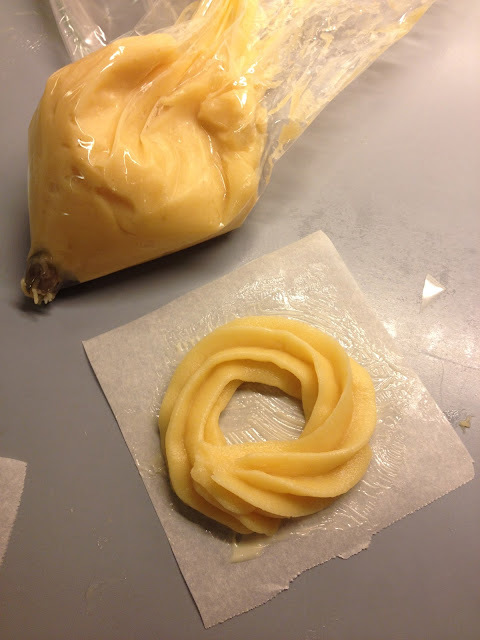 Test a little piece of the dough to see if the oil is ready. If it is, gently place one of the squares dough-side down. The parchment paper will come off by itself. Take it out of the water with tongs (unless you just happen to love the interior decor of the Emergency Room- then you can use your hands). Flip the donut over when the bottom side seems golden brown enough. 7. 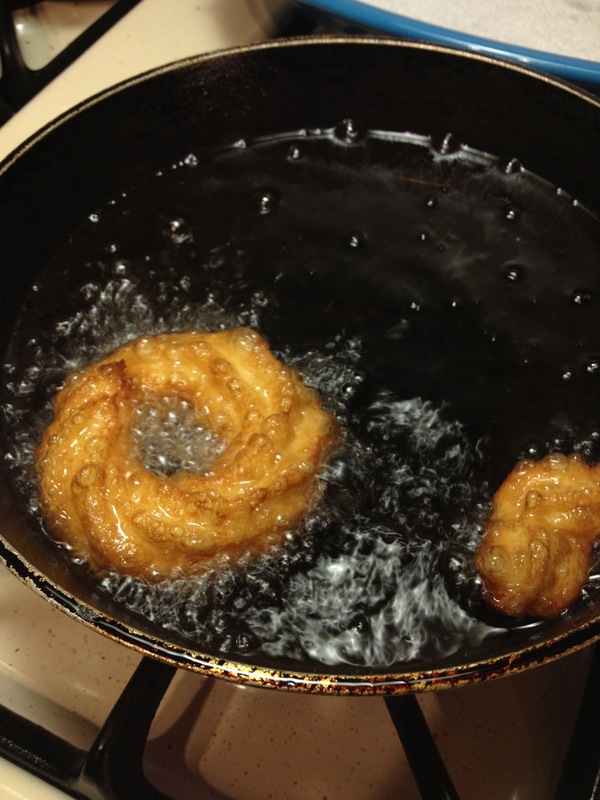 After frying both sides, take the donut out and place on paper towels. Dip in glaze, dust with powdered sugar, or eat plain! 8. Repeat step seven until you've gained 5 pounds. This one is filled with fresh peaches and drizzled with fresh blueberry reduction... Oh man my keyboard has drool all over it! I thought that was cheese. Had a fatty moment.